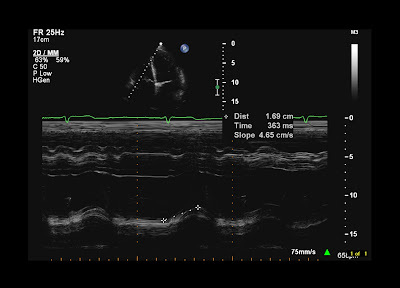 Bedside echocardiography has a useful role to play in the identification of right ventricular dysfunction in acute pulmonary embolism. But what's the best way to identify right ventricular dysfunction? One commonly used criterion is the ratio between right ventricular and left ventricular diameters, measured in a 4-chamber view (which can be done either on echo or on CT). An RV:LV ratio of >0.9 is used to define right ventricular dysfunction in this setting, and has been included in guidance by the American Heart Association. However, a paper by Pruszczyk and colleagues advocates the use of TAPSE as a better option than RV:LV ratio. 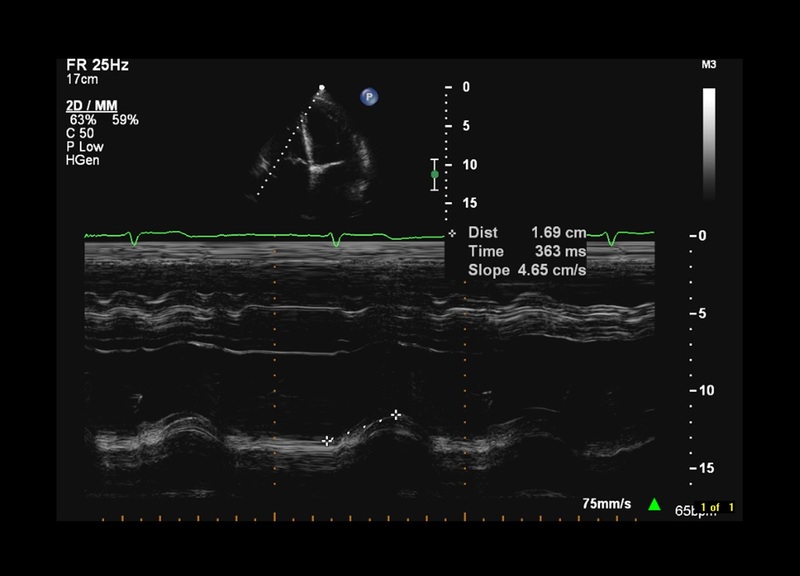 TAPSE is tricuspid annulus plane systolic excursion, and is simply measured using M-mode echo in an apical 4-chamber view. The M-mode cursor is placed at the tricuspid annulus, and the longitudinal displacement of the annulus during systole is measured in millimetres (see illustration). Pruszczyk and colleagues found that a TAPSE of 15mm or less was associated with a higher risk of 30-day mortality from acute pulmonary embolism, whereas a TAPSE of >20mm was associated with a very low risk of mortality. The authors found that TAPSE performed better than RV:LV ratio in 30-day risk stratification. Pruszczyk P, et al. Prognostic value of echocardiography in normotensive patients with acute pulmonary embolism. JACC: Cardiovascular Imaging 2014; 7: 553-560.